Are you stuck in a career rut? Need to give your procurement skills a boost to grab your dream job? Then pay attention! The research is in, and the procurement leaders and CPOs have spoken. Nearly 80 per cent of supply chain executives believe it is critical for new hires to have leadership and professional competencies. But how can procurement professionals achieve this? And how can they fit professional development into already busy lives? This is where the Procurious Career Boot Camp comes in. If you missed our launch last week, or are bursting with questions about it, read on. We have all the information you need! 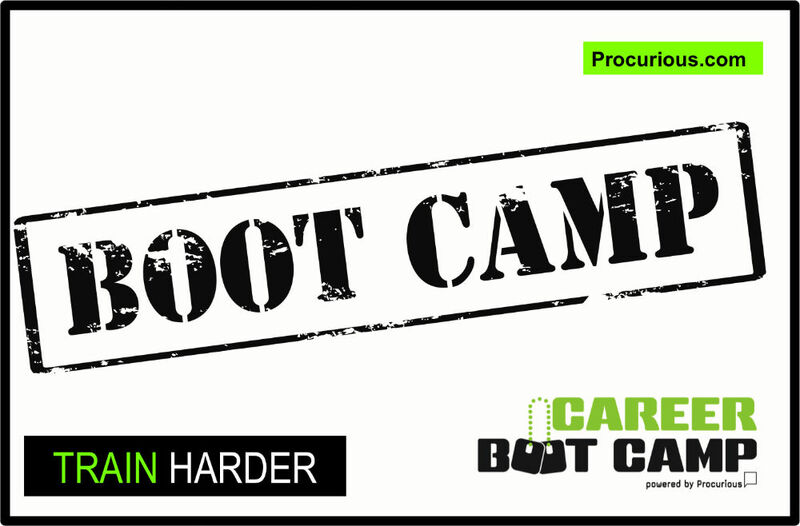 What is the Procurious Career Boot Camp? The Procurious Career Boot Camp “Get in the Best Career Shape of Your Life” is a global professional development event for procurement and supply chain professionals hosted on procurious.com. It is designed to help you build vital skills, networking and advancement opportunities for your career. The series will feature daily podcasts with tips and insights from some of the leading experts and influencers in the procurement space – our “Career Coaches” – to help you flex your career muscle (see more below on who some of these influencers are!). We’ll accompany these podcasts with daily blogs from our “Career Coaches” and vibrant group discussions on Procurious. Procurement is the fastest growing profession in the world, with more than four million practitioners worldwide. It’s also a profession that offers tremendous growth and advancement opportunities over the long term. However, not all professionals have access to formal, targeted training or mentoring. 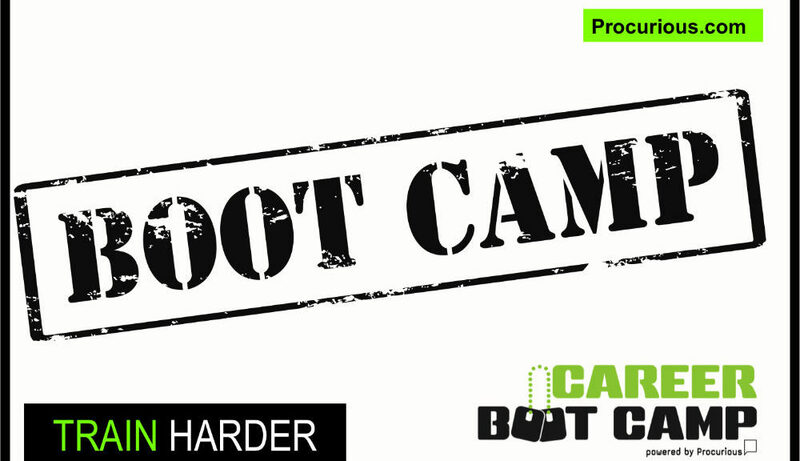 This first of its kind Career Boot Camp aims to support this by helping our members to improve their career fitness! There is a wealth of research that shows the benefits of professional development. APICS, a professional association for supply chain management, has highlighted just a few, including allowing procurement and supply chain professionals to expand their outlook on the field, foster new ideas for the workplace, set them apart from other candidates, demonstrate their commitment to the industry, and increase their confidence. We will let you sample one episode for free via email, but you do need to be a member of Procurious to take part in the full Boot Camp. For non-members, this is a great time to sign up for Procurious. The skills you learn during the Boot Camp will help your next discussion with your boss on that raise or promotion you’re looking for. It’s very easy to register – just click here and sign up! Yes! Once you sign up to become a member of Procurious, you’ll have access to all of the content around the Boot Camp, as well as all of the resources on Procurious, including featured classes, e-learning videos, podcasts and much more. Boot Camp is 15 days. Each of the podcasts is available for one day only. The podcasts will be accompanied by daily blogs from your “Career Coaches” and group discussions on Procurious. Why do Boot Camp every day? Just a few minutes a day can make the difference between standing still, or moving quickly into more impactful roles. Studies have found that a majority of business leaders said hiring people with both technical and leadership skills was important to their companies. Toning up on your career fitness a few minutes a day will help you get in the rhythm of this important, daily habit of investing in your career advancement, skill development and professional networking. Who are some of the “Career Coaches” taking part? I’m on the fence – why should I sign up? An increasing number of CPOs at leading companies have direct access, and a strategic input into, the CEO. Procurement is a profession where you can make a business-critical impact, from addressing supplier disruptions to improving innovation. But, with globalisation and technological change disrupting every aspect of the profession, making time for career development, training and up-skilling is critical if you want to get ahead! With Boot Camp, you can soak up the insights from the global community that will help you develop those skills and advance your career. I’ve got some career ideas of my own – how can I get more involved? Great to hear! You can Tweet us @procurious_ or reach us on Facebook. Or you can share your own ideas with the Procurious community by joining the Boot Camp Group page and posting to the community feed. If I’m not a member of Procurious already, how can I sign up? Just click here to sign up to become a member of Procurious! If you’re a member of Procurious already, you can visit our dedicated Career Boot Camp page to sign up for daily delivery of the podcasts to your email inbox.